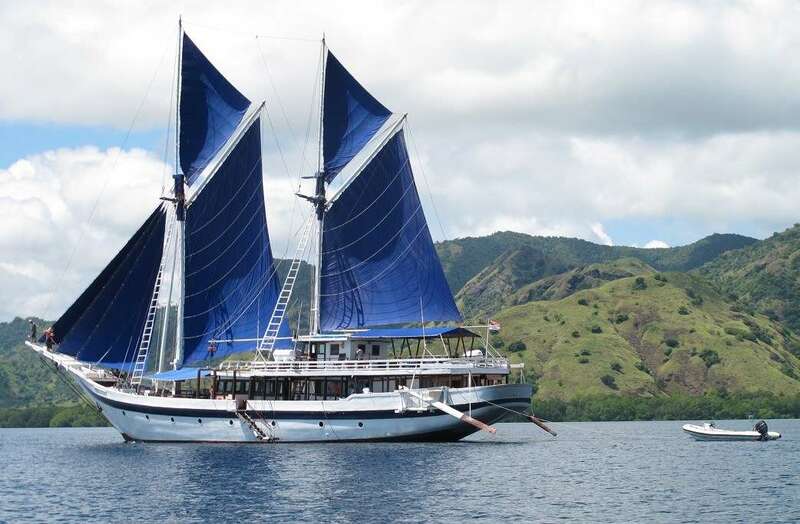 In December 2015 I joined a mixed group of American, European, Australian and New Zealand guests on this handsome motor-sailer, during a 12-day voyage through some of the most historic – and most remote – islands of our vast, archipelagic neighbour, the Republic of Indonesia. My role was to deliver nightly lectures about the maritime history, cultures and traditions of the islands we were sailing through. It’s a truly extraordinary maritime world of 17,000 islands, and one in which the Australian National Maritime Museum has taken an increasing interest over recent years. The vessel is Ombak Putih (‘White Wave’), constructed of tropical forest hardwoods in the ship-building traditions of the Makassan and Bugis seafarers who made annual trading and fishing voyages from Indonesia to northern Australia long before European settlement. Not everyone is familiar with this aspect of Australia’s ‘discovery’ history, or who the Makassans or Bugis were, so I’ll return to this a little later. 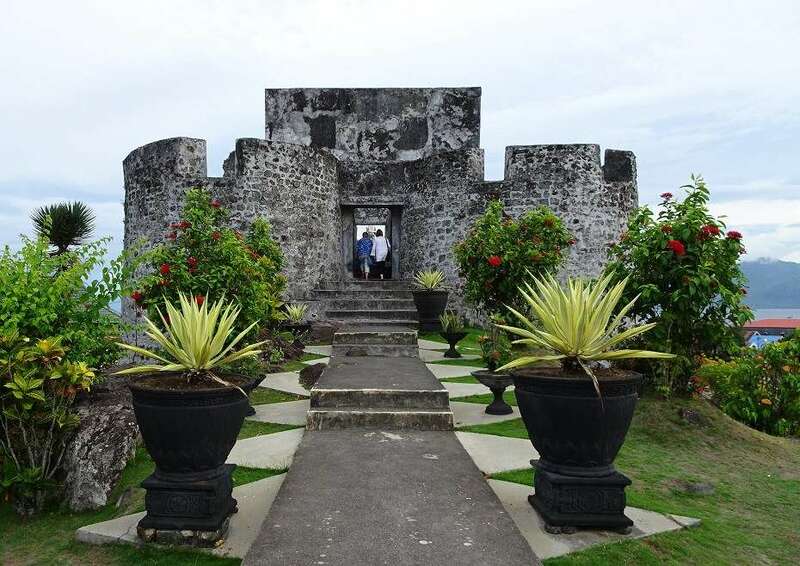 Our voyage started in Ternate, one of the original Spice Islands that rises as a perfect volcanic cone from the Molucca Sea just a few miles from the equator. Climate, geography, and isolation made these remote islands the sole source of two of the ancient and mediaeval world’s most valuable commodities – cloves and nutmeg. These aromatic spices were distributed to the known world along a web of sea routes, avidly traded by Chinese, Indian, Arab, Greek, Roman and other Mediterranean merchants. Their societies’ wealthy elites happily paid outrageous prices for such rare luxuries, as markers of their wealth and status. To cut out the middlemen, Renaissance explorers Christopher Columbus and Vasco da Gama famously set off in different directions to find their own way to these unknown islands of spice. Our group visited forts erected or captured by Portuguese, Spanish, Dutch and English rivals, and the mosques and palaces of the sultanates they ruthlessly subdued in their quest to monopolise these priceless spices. We crossed the sailing tracks of Magellan’s Trinidad & Victoria, Drake’s Golden Hind, Dampier’s Cygnet and little Duyfken, the first known European ship to reach Australia. All of them were looking for those few tons of cloves and nutmeg that would richly pay off their shockingly long, hard and dangerous voyages to the other side of the world. Jumping ahead to the 19th century, we also sailed the same waters as the great Victorian naturalist Alfred Russel Wallace – inventor of the field of bio-geography (the Wallace Line), and co-discoverer with Charles Darwin of the theory of evolution by natural selection. Wallace was out there sailing in native prahus in his search for the birds of paradise. 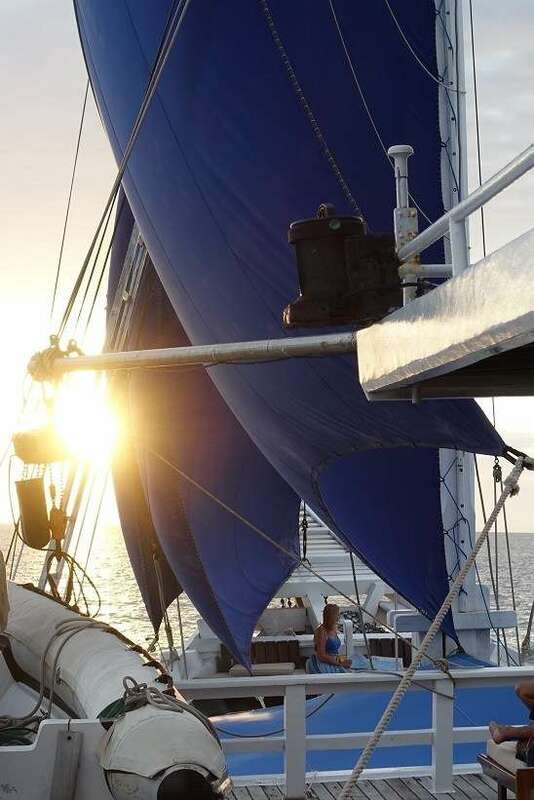 Sailing west via the truly remote Sula and Banggai Archipelagos, each day we met a different culture, language or tribal group in isolated villages accessible only by sea. 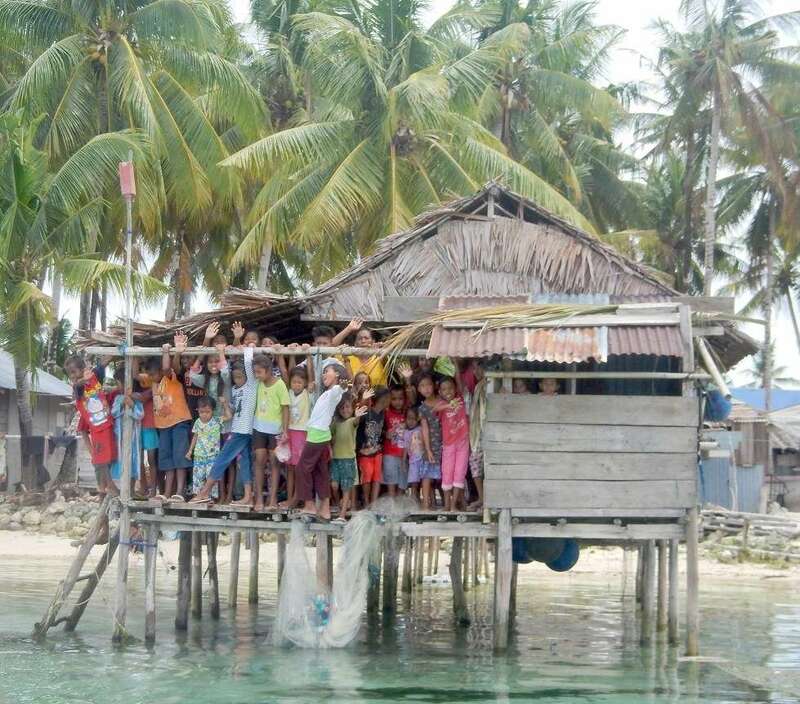 Some Sea Gypsy settlements rose out of the sea in mid-ocean, perched on poles over submerged coral reefs. On the isolated east coast of Sulawesi – the big, many-limbed island draped like an orchid across the equator – we trekked up a river and hours through the forest to meet the Wana, Indonesia’s last semi-nomadic, animist tribe. Disembarking in the port of Kendari, it took two more local flights to reach an international airport to take us home. For Australians our neighbour Indonesia is a gateway to the wider Asian world and is well worth getting to know better. Our nations are both maritime entities, but in very different ways. Indonesia, the world’s largest archipelago, was and remains a tropical crossroads of international maritime commerce. Australia is more isolated and distant, an island continent bordering remote southern seas. But both depend hugely on the sea for resources, transport and trade, security and defence, and indeed for a sense of identity. As neighbours, our maritime histories have overlapped. Humans first island-hopped through the Indonesian archipelago to populate Australia. A few thousand years ago maritime visitors from Australia’s north didn’t settle but left a calling-card – the dingo or Asian dog. The same Bugis culture that built our comfortably appointed cruise craft Ombak Putih was active in the earliest overseas trade with Australia, which once linked it with Imperial China. 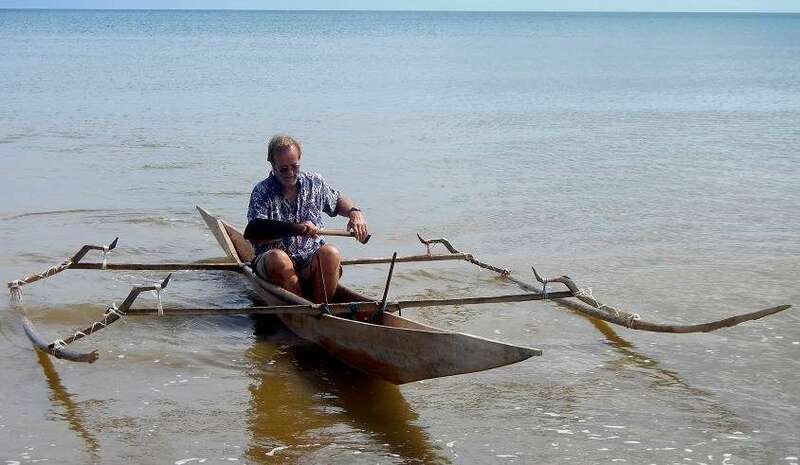 Each year the Bugis sailed with Makassans and other maritime clans from the island of Sulawesi to northern Australia, working with Aboriginal communities to gather edible holothurian sea slugs from tropical shallows. From Sulawesi the preserved sea slugs were traded to China where they were prized as an expensive gourmet, medicinal and aphrodisiac commodity. 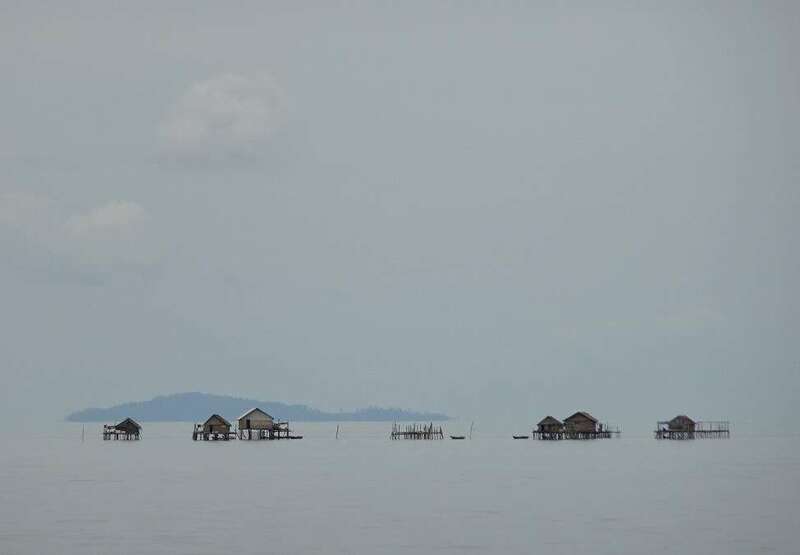 Some Aborigines sailed back to Sulawesi with their visitors, who left behind many traces in Aboriginal language, culture, technology and bloodlines. In 1906 these voyages were stopped by Australian customs and immigration officials, an early exercise in border control. Ombak Putih was built 90 years later in south-eastern Kalimantan (the large island of Borneo) by migrant Bugis shipwrights. With her traditional sailing rig, she is based on the biggest of the engineless sail-traders that served the developing Indonesian economy throughout the 20th century. These were the famous Bugis and Makassan pinisi that carried tall, top-sail ketch rigs with a staysail and flying jibs. Although Ombak Putih has a modern fit-out of diesels, generators, air-conditioning, freezers, water-makers and outboard tenders, her solid, seaworthy hull of kayu ulin (ironwood) is built by hand using unique local construction techniques. Some of her distinctive design features can still be traced back to the Bugis-Makassan fleets that sailed to northern Australia in past centuries. Ombak Putih and a sister-pinisi, Katharina, are operated by an Indonesian company called SeaTrek, based in Bali. The company is committed to preserving their ships as living artefacts of traditional Indonesian and Bugis-Makassan maritime heritage. 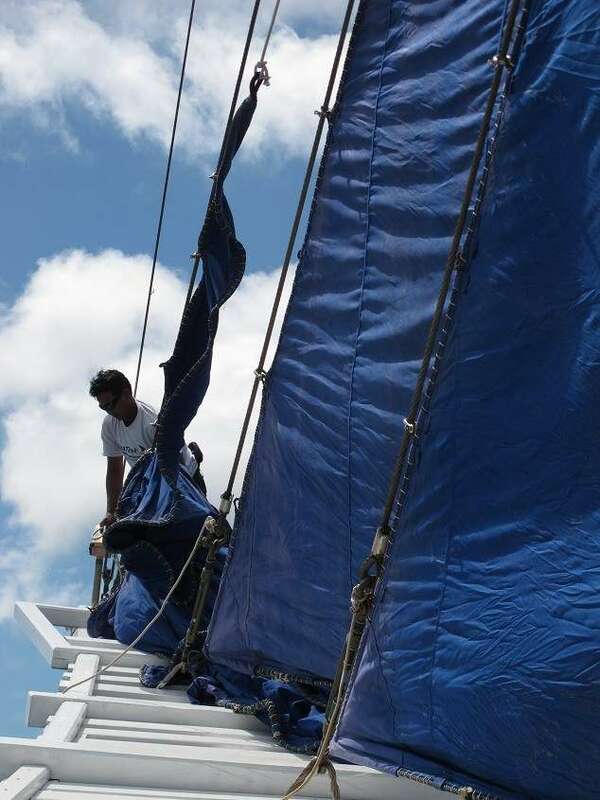 By using the auxiliary sailing rigs whenever conditions allow, a new generation of Indonesian crews recruited from many different parts of this island nation are learning and maintaining sailing skills that were at risk of dying out since the recent modernisation and motorisation of a huge sailing fleet. SeaTrek is also committed to making Indonesia’s varied maritime cultures and history more accessible, through its voyages to out-of-the-way parts of the archipelago. While conditions on board are amply luxurious for up to 20 passengers and include high-quality Indonesian and western cuisine, Ombak Putih can land guests in places that larger cruise ships could never access. In some of these places, SeaTrek guests are the only foreigners that villagers ever encounter. The knowledge component of these cultural cruises is emphasised, by providing expert lecturers covering a range of fields. Several SeaTrek itineraries over the coming year put me on board in that role, as a research associate of the Australian National Maritime Museum. In early March 2016 we’re returning to the Spice Islands in time for the next total solar eclipse; in November we’re going to the little-known Kangean Islands and Madura; and in January 2017 we’re back in the Sula and Banggai islands. These and SeaTrek’s other voyages are detailed at http://seatrekbali.com/cruises-and-schedule/. Jeffrey Mellefont was a founding staff member of the Australian National Maritime Museum from 1987, and was the editor of its quarterly journal Signals. On retiring in 2014 he was appointed honorary research associate. Formerly a mariner, navigator, marine journalist and photographer, he has a lifelong research interest in Indonesian and Asian maritime history.